On behalf of Food Secure Canada and its members, I congratulate you on your success in the recent federal election and your appointment as Minister of Agriculture and Agri-Food. 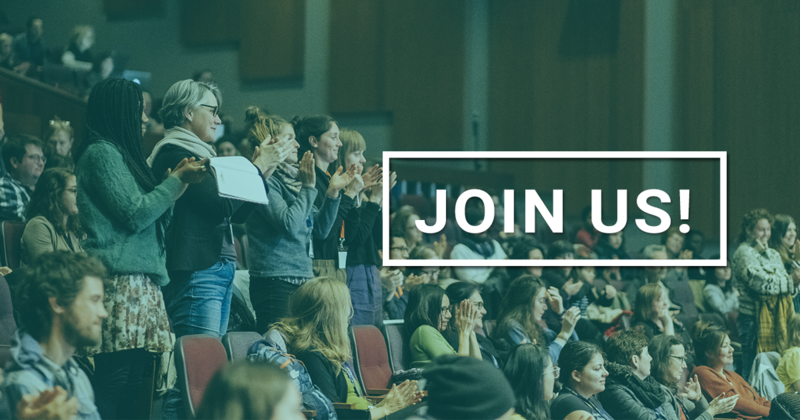 Food Secure Canada is a national membership-based alliance of organizations and individuals concerned with zero hunger, healthy and safe food, and sustainable food systems. Our membership spans from coast to coast to coast and includes farmers’ organizations; food banks; international non-profits; Indigenous leaders; institutional food providers; food businesses; community food centres; health, nutrition, youth and research organizations; and many others. We are strongly encouraged by the Prime Minister’s inclusion of a national food policy in his mandate letter to you. This is indeed what hundreds of organizations and thousands of Canadians called for in the national Eat Think Vote campaign during the election, in which over 40 newly elected parliamentarians participated. Food is central to some of Canada’s most important policy domains: it accounts for one in eight jobs in this country, is a critical determinant of health care costs, is vital to our climate change and environmental policies, yet an adequate healthy diet is simply out of reach for an estimated 4 million Canadians. Despite the interrelated nature of food issues, Canada lacks a coordinated and integrated approach to ensuring the food system fosters equity, health and sustainability. A national food policy could address this by creating a comprehensive policy framework that approaches health promotion, environmental sustainability, economic development, and social justice from a food-systems lens. It would unite activities across all food-related domains, scales, actors and jurisdictions and employ a wide range of policy tools and governance innovations. The governance of the food policy is clearly the most critical issue needing to be tackled in the short term. We are advocates of a highly collaborative approach that looks beyond the narrow interests of one economic sector to assess how federal food policy can help the Government of Canada reach its other national goals: a healthy and sustainable Canada, with a diminishing carbon footprint and bright opportunities for youth. The emphasis on healthy food in the mandate letter suggests that the Minister of Health will have a supportive role in the development of a national policy. In addition, during to the election, the Liberal Party responded to Food Secure Canada’s questionnaire stating its support for developing and funding a national strategy to reduce food insecurity in Canada, recognizing that access to sufficient, healthy, adequate food is a fundamental human right. We understand from this that there will also be a key role for the Minister of Families, Children and Social Development in developing a food policy framework. In our view, it would also be appropriate to include other Ministries with food responsibilities, such as Fisheries, Oceans and the Canadian Coast Guard and Environment and Climate Change. Could you kindly confirm that you share our understanding of the need for a whole-of-government approach, albeit one in which Agriculture and Agri-Food Canada plays a lead role. Finally, we are delighted with your government’s commitment to a renewed relationship with civil society and a more open approach to policy development. A comprehensive national food policy must include civil society organizations as part the governance design from the beginning. 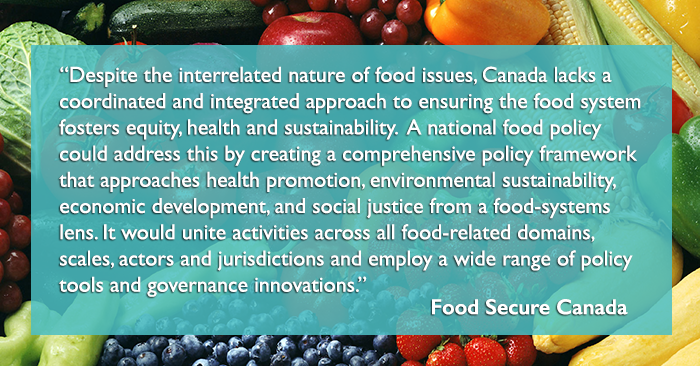 As you may know, Food Secure Canada has a truly strong and diverse national network of organizations, with representation from all regions and many sectors. Thousands of Canadians were involved in the development of Resetting the Table, which was published in 2011 and explores options to put healthy, safe food on the tables of Canadians; support Canadians farmers, including the next generation of farmers; reduce food insecurity by combatting poverty; ensure that all children have access to healthy food in schools; and lessen the environmental impacts of our agricultural system. 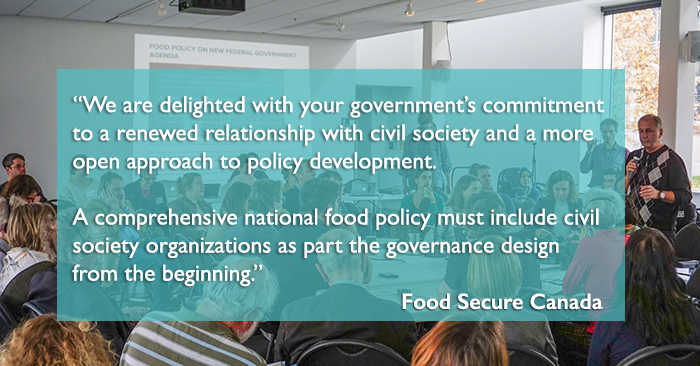 We are eager to offer our expertise and skill in convening food organizations to contribute constructively to Canadian food policy development. We have already held over 68 community meetings on this topic during the Eat Think Vote campaign, in addition to webinars, training sessions and other public fora, and we are confident that our networks have critical expertise to contribute to this national dialogue. We recognize that there are many ideas on the table for developing a national food policy and we are hopeful that the Government will be successful in its quest to develop an inclusive and efficient process where all stakeholders can contribute. I would be very pleased to meet with you at your earliest convenience to discuss how Food Secure Canada can contribute to this process. We look forward to working with you and with all other relevant Departments in assisting in the development of a national food policy.